This course teaches strategies people can integrate into their everyday lives to avoid becoming a victim of crime. Students will learn common weaknesses that criminals may take advantage of, and a variety of corrective measures that are practical, inexpensive and easy to follow. It includes classroom instruction on criminal psychology, automobile crimes; cyber safety, home security, and a variety of crime prevention strategies including carjack avoidance techniques, use of personal safety devices, and more.This is not a firearms instruction course, and does not include instruction in physical combat self-defense. 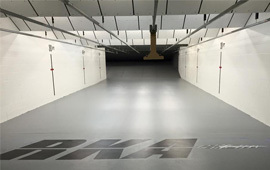 The goal of this program is to provide the knowledge, skills, and training necessary to learn pistol marksmanship using a virtual training program. Students use a simulated pistol that has a resetting trigger and uses a laser to indicate where the shots are being hit. It will teach the fundamentals of sight alignment, trigger, grip, and breath control. Computer software records the shots and provides instant feedback to students. This is an excellent course for those who are interested in taking steps to increase their level of personal defense but aren't sure they are ready for live firearms, or for those that want to practice their fundamentals without investing in live ammunition and range time. During this 2 hour classroom course, you will learn the basic knowledge and skill to handling and properly securing a firearm found on the scene. Students will learn the basic fundamentals of semi automatic pistols, revolvers, rifles and shotguns; how to check to see if they are loaded and properly unloading a loaded firearm. No Live Fire.